Sunshine has returned for the latter half of the week and that looks to continue right on into the weekend. Temperatures remain elevated as the summer-like feel continues for the weekend. Things remain on the warm side of things as an upper ridge keeps things dry and temperatures warmer than usual for this time of year. We’re kind of stuck in a holding pattern, with a surface high hanging on to the north, while we await what happens with both the next weather system out in the plains and what will be the remnants of Hurricane Florence. For us, this means another day with mostly sunny skies and hot and muggy conditions. Highs today will once again top out in the upper 80s to near the 90º mark. Other than some patchy fog in the morning, just a good ol’ fashioned summer day…in September. Owing to the humidity in the air, overnight lows only slink down to around 70º as skies remain mostly clear. We once again remain between a high and a hurricane tropical storm as Saturday’s conditions will make you want to stay inside, sip on some lemonade and watch some fine college football action. Mother Nature’s lever is stuck squarely in “summer” mode once again as temperatures soar into the upper-80s. Skies remain mostly sunny, not impeding one bit the suns rays as they beat down on the Earth’s surface. Overnight lows fall back to around 70º again but changes are on the way for Sunday. The remnants of Hurricane Florence will inch just a touch closer to the region for the day on Sunday, and this could throw a few more clouds our way. This should lower temperatures closer to the 85º mark as opposed to the 90s. And while it will still be muggy, chances are we’ll stay dry except for a couple of isolated showers. As Florence’s remnants churn a little more this direction, it wouldn’t surprise me to see a few more showers and maybe a rumble of thunder during the nighttime hours Sunday and into Monday before Florence gets wrapped up in our next weather maker and skedaddles. 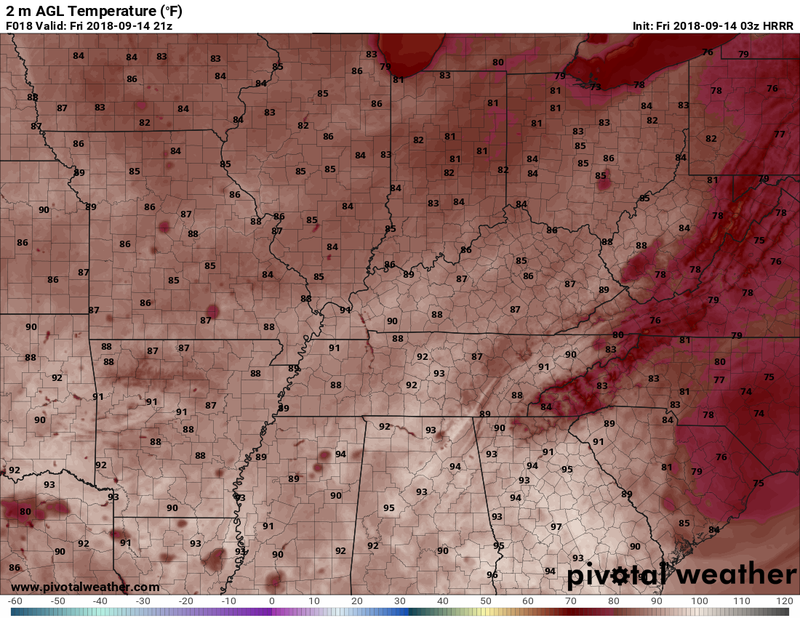 Lows overnight Sunday remain around 70º.